It’s a funny thing to imagine: The Black Lips being cops. Funny because it makes us think how much more fun the streets would be if these guys were out patrolling every night instead of these guys being out every night. Also funny because we think that — just maybe — if The Black Lips hadn’t have broken it big a couple years ago, maybe one or two of them would’ve actually resorted to being boys in blue. We’re glad that’s not the case though. This new video for what’s probably the catchiest track on their most recent record, Raw Meat, is a pretty short and sweet trip into the supposed world we just talked about. Looks like fun. The video was also put together by Urban Outfitters [weird] Hope the guys got all the free joke books and record frames and cheaply-made clothes they could handle! Check it out below… and snag Arabia Mountain here! 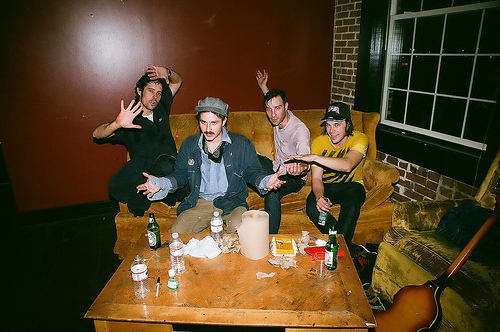 Black Lips – “Raw Meat” from Urban Outfitters on Vimeo.